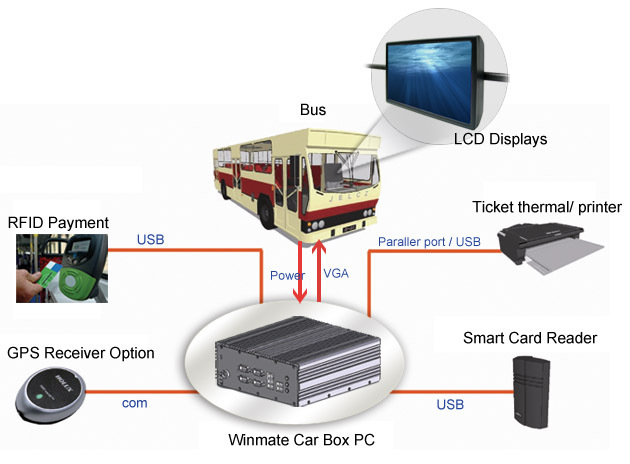 Winmat's IA70 Intel Atom Car Box PC is solid-equipped and energy saving solution for automobile. With up to 2GB of DDR2 memory supplied via one SODIMM, the IA70 BOX PC uses Intel Atom N270 and Intel 945GSE/ ICH7M chipset that can lower power consumption. A variety of input/ output include four RS-232s, six USB ports, one Parallel port, one RJ-45, one VGA, one Audio Jack, and one DC-in Power Jack. The firmness of IA70 Car Box PC is shown from the design of IP54 and anti-vibration and anti-shock that can be helpfully used in harsh environment. The special thermal design also raises the performance in wide range temperature environment. IA70 further passes the international standard of IEC 60068-2-38. Installed on the bus, it is easy to maintain and will not be broken by outer forces. Integrated with the ticketing system, it offers passengers to purchase the tickets on bus. Passengers can check the bus station information and find out where to get off by the GPS technology. Reduce the time of purchasing tickets.